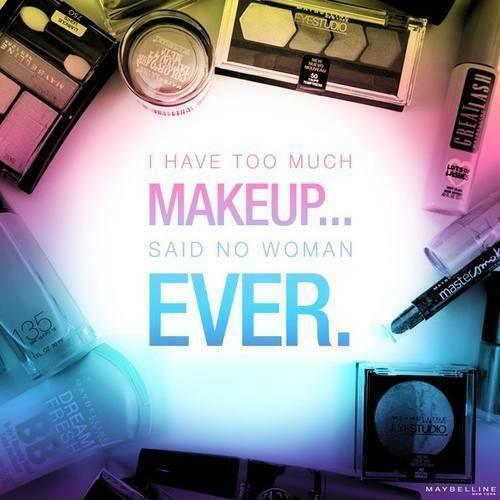 Confession: I have too much makeup and skincare products and they're all littering my dresser and drawers!!!! So what do you do? 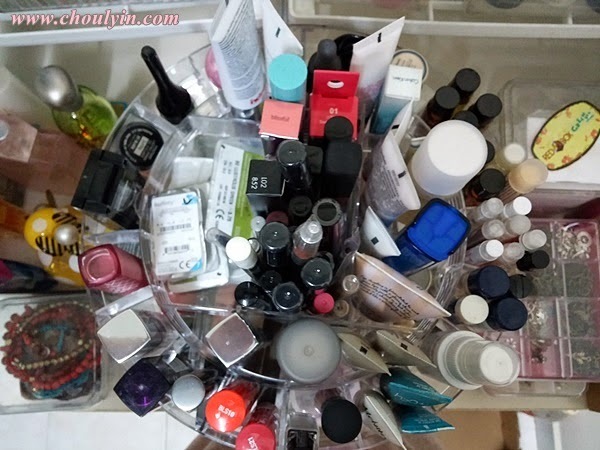 Get a makeup organiser!!! 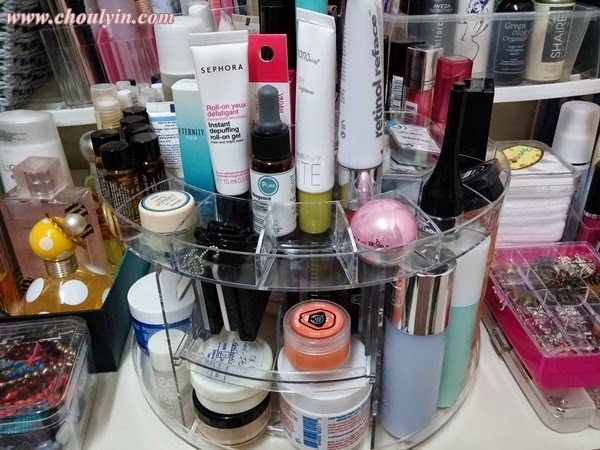 And believe me, I have come across many makeup organisers, some super expensive (in the hundreds so obviously I didn't get it), some super cheap (from Daiso, but too small!! 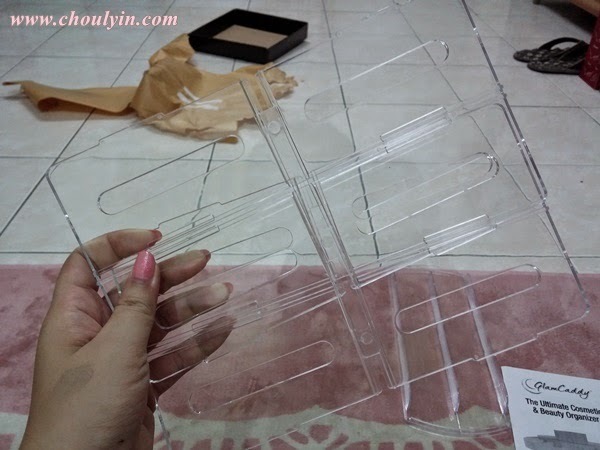 ), and some not made for that purpose but I used it anyway (from Ikea, and empty box covers from past beauty boxes). 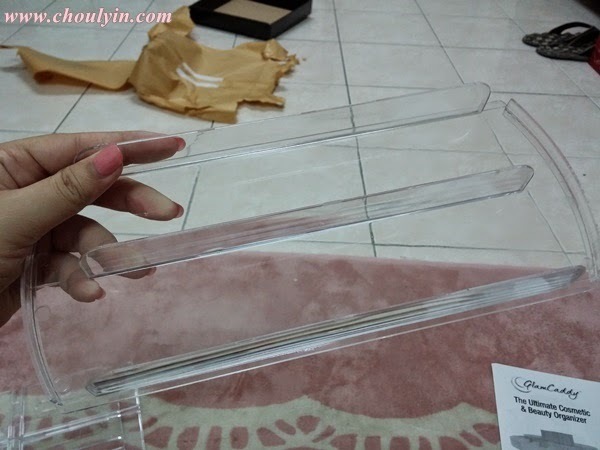 Then I came across a blogpost by Fiona here *click*, where she got the most beautiful rotating organiser which her friend helped her to buy overseas. So I did a little bit of stalking, and found out she had extra! But alas I was too late, and all her extras are sold out. 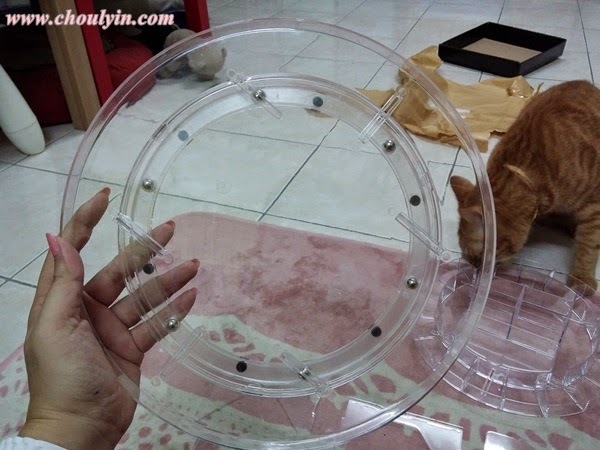 So I did a little bit more stalking and found one on Lazada! I got it a few months ago, and it costed me RM49.90 (without shipping) with a further 10% discount if I were to use a MasterCard. 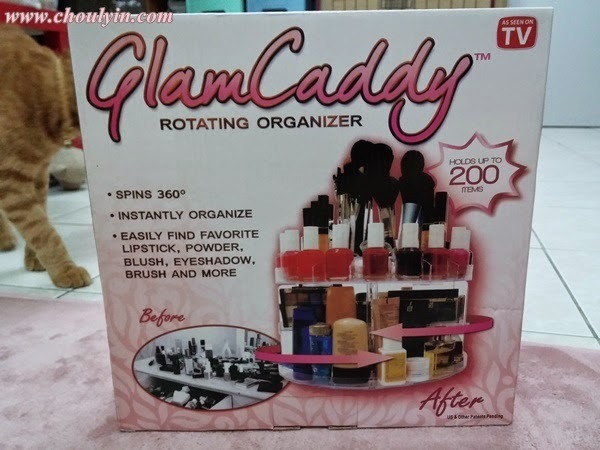 So, plus shipping of RM15 (minus 10% of RM4.99 with my MC), I paid a total of RM59.91 for my GlamCaddy. Of course, with Lazada, you will need to search a little bit more and be patient while looking for stuff cos there are a lot of sellers on there, so they might be selling the exact same thing, but at different prices. So here's a tour of my GlamCaddy, and can it really fit up to 200 products? Photos featuring my cat in the background sniffing around. I had to leave the packaging on the floor so he doesn't come near the GlamCaddy (but it kinda failed :p). Here are all the parts of the GlamCaddy. It's transparent so I've tried to contrast the photos so it shows a little clearer, but still remains hard to see -.-"
Here's the bottom part of the GC. Those little round balls you see on it are the roller balls that is supposed to help you spin 360 degrees. The top part of the GC. 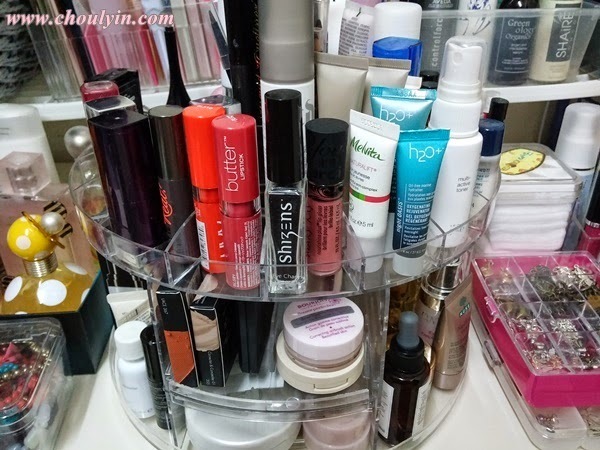 It has a breakdown of separate compartments along the diameter for lipsticks and nail polishes, but I keep my nail polishes elsewhere so I don't put them in the GC. The side panels of the GC to hold everything in place and connect the drawer to the top and bottom. This is the drawer in the middle. I like that they have this, cos it really maximises the space. Otherwise, they could have just made the GC a little bit shorter and stouter, but I doubt it will look this pretty without the drawer, so I would say there's also an aesthetic value to it. 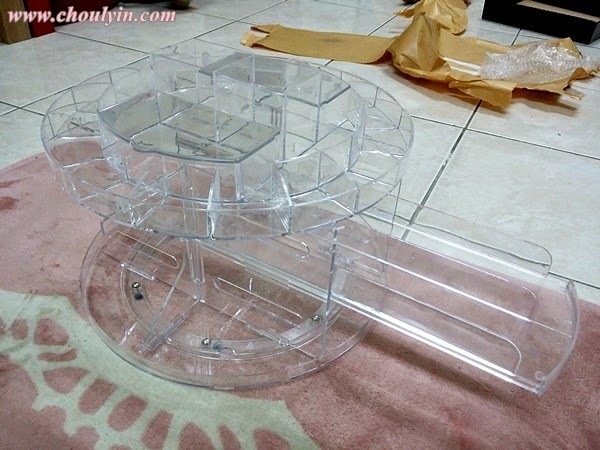 So that's all the pieces, and time to assemble it! Voila! After assembly of all the parts. It's pretty simple to put together actually, and I love how it looks all pretty and shiny and new :D I think it only took me about 10 minutes. Top view of the GlamCaddy. 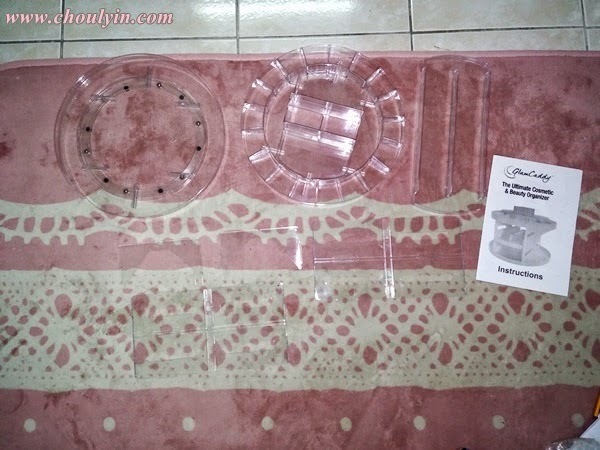 As you can see from the previous photo, the top part has two sections where you can close them, and can be used to put cotton pads or cotton buds (like how Fiona did). 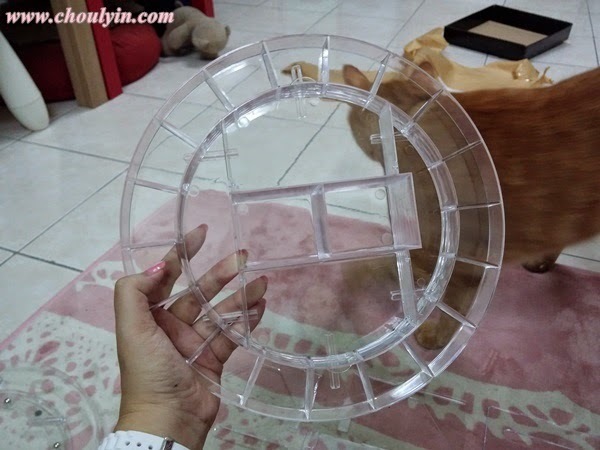 But I already have a separate container for that, so I simply used one compartment to store my new contact lenses, and the other I leave open to keep other stuff. .....and here's the other side! So altogether, I had 96 + 12 + 27 = 135 products on my GlamCaddy. 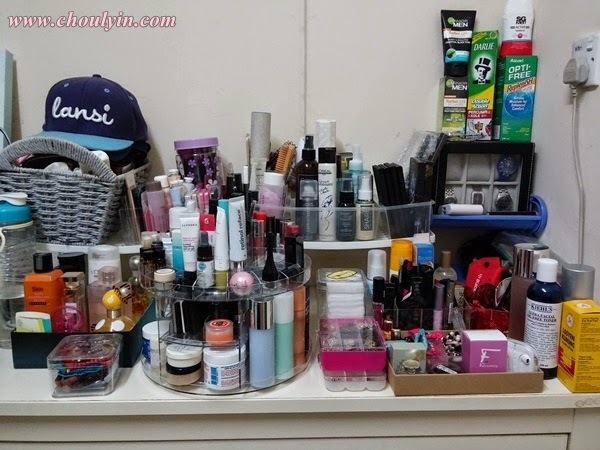 Not up to 200, but I have added a few more products to it since I started using it, so I daresay it can easily reach 200 products. 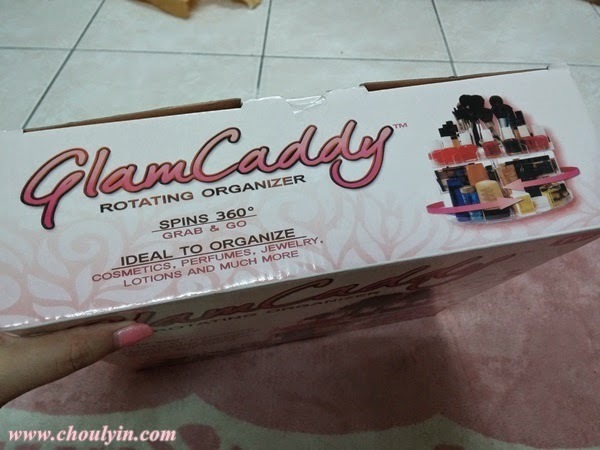 I like the GlamCaddy because it is very convenient for me to put all my makeup and skincare in one place. I just need to rotate it to get any product I want. 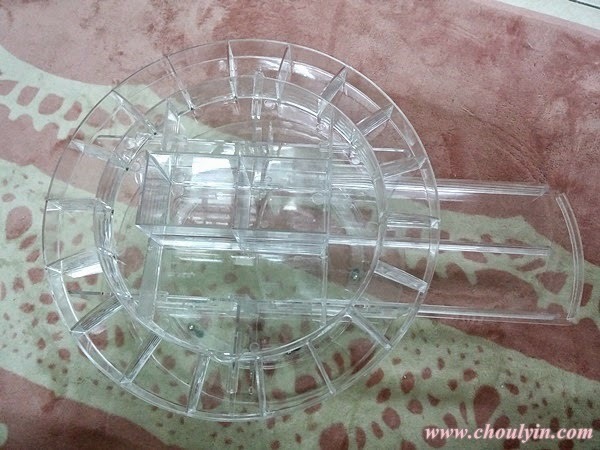 BUT the rollers are not smooth, so though it can rotate, it takes a bit of time to spin. You'll need to hold both ends of the caddy to spin it, and even then, you will need to spin it slowly so that the products don't fly off from an excessive jerk. So here it is sitting snugly in the middle of my dresser. I love it! 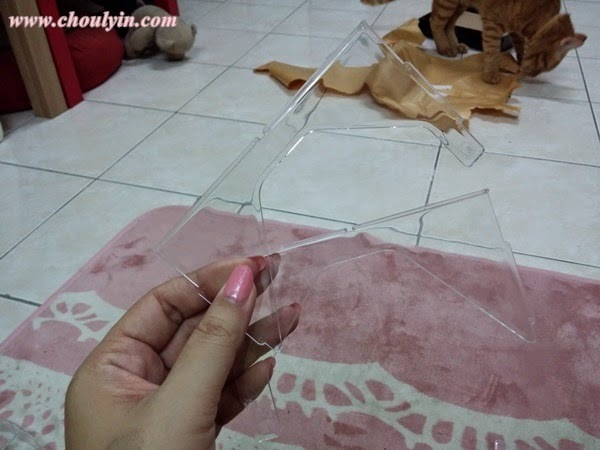 Last Comments: The product is made of plastic, and not acrylic, which is why it was so cheap, but I was pleasantly surprised at how it's still standing today, and how sturdy it is. 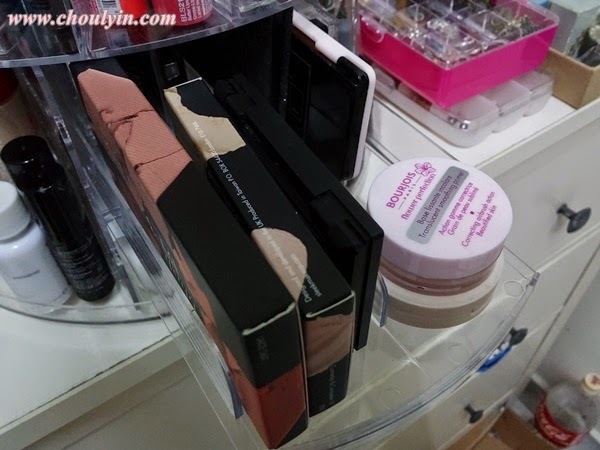 QBmakeupcube also has the GlamCaddy, and it is going for RM60 without shipping. 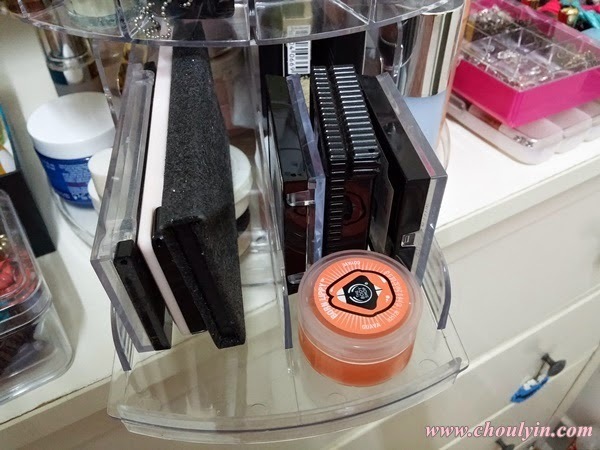 But QB also provides other acrylic makeup organisers, so you can browse for others as well if you don't like the GlamCaddy. So what do you think? Will you be getting one for yourself too? Wah after you wrote about it sure habis stock! !